Nothing warms my pioneer blood like clothes hanging on a line to dry. For me it’s a chance to unwind while I take care of household business. It’s a wonderful basic country skill, but, after so many years of doing it, I have found ways to make it easier and avoid its pitfalls, such as dust and scratchy towels. 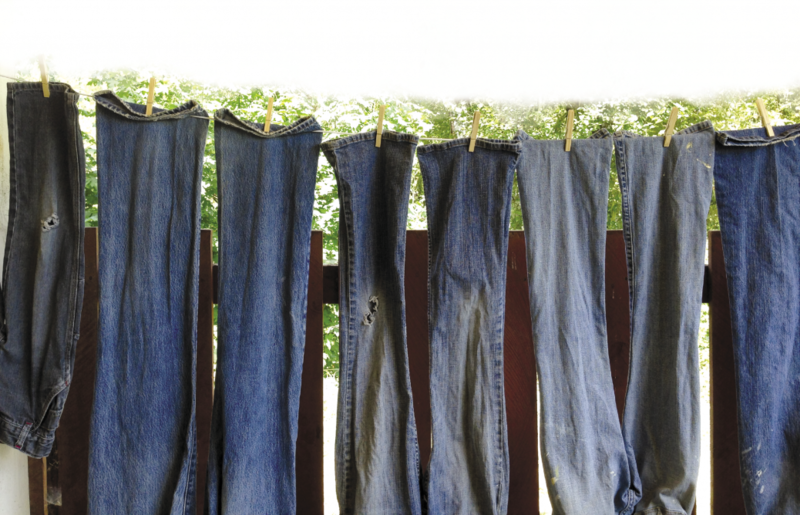 There are also monetary benefits to line-drying your clothes. The most obvious is how considerably it lowers your electric bill — twofold! First, by not using power for the dryer, and, second, by not heating up your house and forcing the AC to work harder. A second benefit is whiter whites. Ever leave something in a window too long and find the color faded? Sun-bleaching is an ancient tradition that is still practical. Bonus: the sun has germ-killing powers! Hanging laundry is pretty simple stuff, and I’m not here to complicate it. Whether you’re new to it or an old hat like me, if you’d like to get the most out of it, here are a few tips I’d like to share from doing this a few years. Towel the line — It’s warm out, and that means pollen is everywhere. Unless you’re into yellow stripes, take a minute to run a damp cloth down every inch of hanging surface. Double up — Hang a piece with two pins, then overlap it with the next piece and use the second pin to hold up one side of the next piece, so that they share it. This works best on thinner pieces, and keep in mind it will slow the drying process a smidgen. This, along with grouping like items, is also helpful when you have a lot of pieces to hang so you don’t run out of pins. Flip out — Remember what I said about the sun? That’s good on whites — leave them be. But, if you want your colors to last, protect their exteriors by turning them inside-out. This is also great for pants because it helps pockets dry faster. Pro-tip: turn underwear inside out. Don’t make me explain why. Whip it good — Give everything a good shake when you hang it. Helps get the dog fur and wrinkles out. If there’s not any wind, clothes dry in the shape they’re left in, so make it a good one. Fluff ‘n stuff — When finished, I like to toss the load into the dryer on the air-dry setting for 5-10 minutes; helps get the dust off and softens. Save this task for late at night or early in the morning before the temperature climbs. Bring it in — Don’t leave clothes on the line overnight, and don’t leave the basket outside all day; the sun dries and weakens the plastic. And if your clothespin bag doesn’t zip, best take it inside so critters don’t move in and surprise you next time you reach inside! Don’t be such a snag — If you have delicate fabrics (satins, laces, hosiery), consider investing in soft-grip plastic clothespins with rubber feet to avoid snags. For everything else my 50 or so wooden pins do just fine. Scoot yer boot — I hang my pin bag over one of the middle lines and move it down as I go so it’s always nearby. I have techniques for hanging every article of clothing. Socks and underthings get one pin each. Shorts and briefs get two — I fold the waistband over the line. Pants are hung upside-down by the leg with a pin on each cuff. Tees, blouses, and polos get a pin at each shoulder. Button-up shirts, however, have their own special way to hang, a technique handed down for generations in my family. Take the two seams on either side of the shirttail, and pin those. This way the shirt hangs upside-down, and the breeze can flow through the armholes. As soon as the daily temperature is in the 50s, I start hanging laundry; this year that was February. And I don’t quit until October-November. If I get up early and the sun is warm, I can get three loads done. For my husband and me, I do one a day during the week to maintain. If the wind is over 10-15 mph, I wait. Better to put it off than risk damaging the clothes. Save sturdy loads (blankets, towels, heavy sheets) for blustery days. Drawbacks? Not many. The occasional rogue bird needs target practice. Spiders and other critters (mostly boxelder bugs) have met untimely ends in the dryer during post-hang fluffing. I sometimes find their shriveled carcasses on my socks and shake them off. The boxelder bugs have been eating my baby raspberry bush leaves — the meanies deserve what they get. I agree with you except about the tee shirts. I also hang them from the waist, upside down, so that I don’t stretch the shoulders.